As part of teaching the children about art, we need to discuss colours and how they are created and percieved. This link is an amazing example of how our perception of colour is in many ways determined by the surrounding colours. This is our educational bit for today. 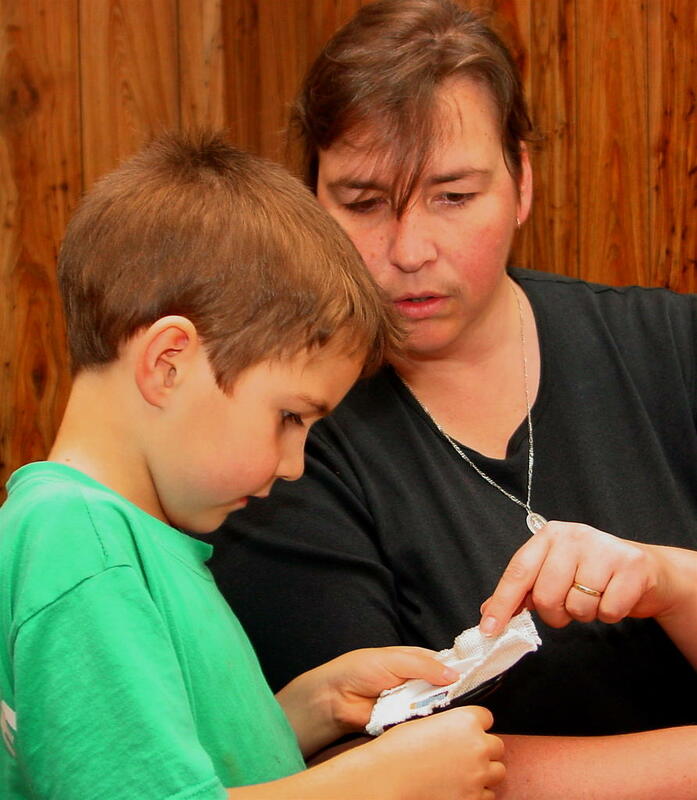 Further to Lana's posts about the children doing cross stitch, here is Lana helping Peter finish the back stitch on his "Outlaw". When Peter sees one of the other children's work, he remembers that he hasn't finished his so he rummages around and a few moments later asks Lana to help him. He does pretty well for a six year old. * Have cash at your fingertips. * Treat yourself to the best summer yet by taking that dream vacation or creating your own backyard oasis! ... PS Use these checks to make your summer unforgettable! I asked Ariel (14) and Eric (11) if that sounded like a good idea. They immediately said, "But you have to pay it back!" Exactly! Using these checks would certainly make your summer unforgettable - "Oh no! That was the summer I am still paying off years later!" Also, the fine print says that using these checks involves a charge of 3% for each transaction (min $10 max $75). Yes - make your summer really unforgettable. Every month I get these checks from all my credit card companies. Every month I shred them immediately. No wonder people get caught in the credit card trap! Never use your credit card if you can't pay it off in full before the due date. If you miss the minimum payment you are also slugged with a penalty amount of between $25 and $75, if you muck up and go over your credit limit or go overdue you may be slugged with penalty interest of over 29% p.a. (*)The word dodgy is a great Australian word meaning one of two things: 1:unreliable, faulty, defective (i.e. the car was dodgy = the car is a lemon). 2:cunning, artful, deceptive (i.e. Politicians are normally dodgy). We are using the 2nd definition here. This is second atrocious tactic by credit card companies. I received a check (cheque) made out to me for $5.00. Normally I bank checks immediately, but this time I hesitated. Why are they giving me money? So I read the fine print. Cashing this check automatically activates a membership in the Travellers Advantage program. Hang on. What's this program? On the back of the check is a box that says "Signature of payee (required for processing)"
Please endorse and cash or deposit this check to automatically activate Travelers advantage, which comes with the first 30 days risk free. followed by 5 point details which actually say that if you don't call the toll free number within 30 days you will be charged $99.99 for annual membership. Then at the end in bold: The $5.00 check is mine to keep. So if someone didn't read the fine print they would find a $99.99 charge before the next statement came out and couldn't complain because they signed the agreement. Also, the agreement is no longer in your possession as you banked it, so look forward to some hassle finding the toll free number. Rule 1: Always read the fine print! Rule 2: There is no such thing as a free lunch. Someone told Eric that "Boys don't cross stitch!". When he mentioned this to me, I told him that it just wasn't true. 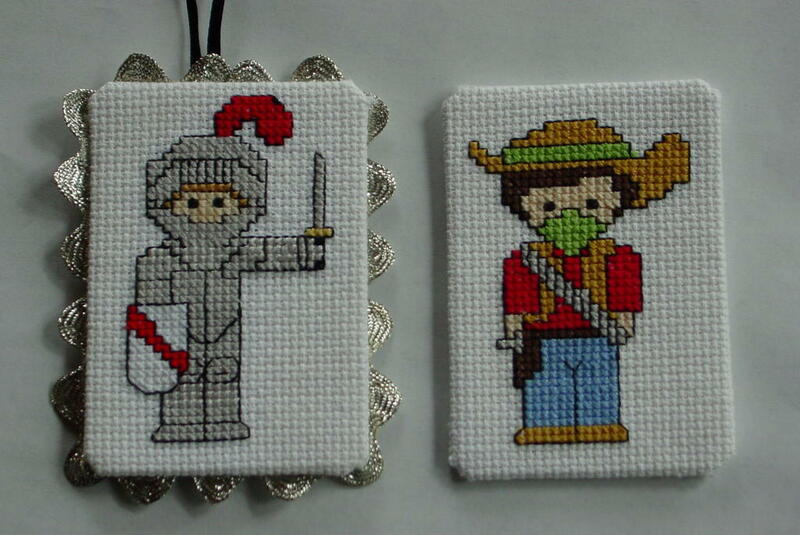 I showed him a number of cross stitch sites that men not only stitch, but design some wonderful patterns. Graeme Ross from Ross Originals has many animals, birds, fish, flowers, butterflies, airplanes, Australian landscapes and many others. I have stitched three of his designs so far, they may appear here at some time. 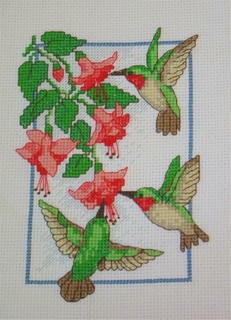 Another one is Heritage Stitchcraft - there are a number of men designing on this page. Cars, planes, ships, trains, silhouettes and more. Eric has stitched these two patterns. 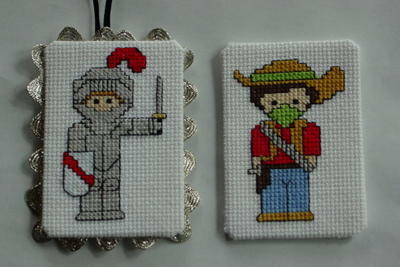 Peter and James have also finished the knight in different colours. Peter is finishing the outlaw. When we listen to an audio book or watch a movie, I try to encourage the children to DO something at the same time, instead of just sitting there. Ariel has recently completed this cross stitch. We came across a site in the internet that had a free pattern "Alphabet with a garden theme". Each flower starts with the accompanying letter and there are also the lowercase letters as well as the butterflies, bees and ladybugs. The pattern is completed quickly, is easy to do and as you can see looks very nice. Lana was looking for some cross stitch patterns for the boys to do whilst listening to audio books today. As a side benefit, we discovered Star Wars Origami. This site has a number of origami (paper folding) patterns for Star Wars designs and other things. Now the boys will probably start using all of my spare paper! Being another sick day, the children were able to be slack. Today they listened to the audiobook "A Little Princess" by Frances Hodgson Burnett. I had read it to them about five years ago, but it all seemed fresh to the children. If you have seen either of the movies you must forget their departures from the book. In the real story a little girl, Sara Crewe, is placed by her father into a boarding school in London whilst he goes back to India. Her father meanwhile invests his whole fortune with his friend in a diamond mine. Not long after Sara settles in to the new school (and being treated like a princess because she is rich) news arrives that her father is dead and all the money is gone. No money, no family, nowhere to go. As one would expect it does all turn out marvellously showing the power of never despairing, the wisdom of large families, the pettiness of many when money is involved and a little bit of what seems like magic. Love and goodness win in the end. As it should. More reviews can be found at Amazon , and this is a book that can be found anywhere pretty cheaply. You may notice I have made some changes to this site. It has been a good exercise in learning HTML - the language all web browsers use to draw the screen. I have made the page a bit wider and cleaned up the side. The archives are now a drop down menu and I have added a recipe list linking to all of Lana's recipes we have included. Also I have some quick links to some articles about family life and the travels we have made. At the bottom of the left hand column is a short summary of visits to this site since last week by country. If you can think of any other changes that would make it easier, let me know. At least we get to see a good movie. Some sort of illness is flowing through the children. It starts with a temperature, lack of appetite and then that ill look in their eyes. Eric was first on Wednesday night and he was better by Friday and all looked well. Then Peter had it on Saturday and Clare on Saturday night, James and Rose yesterday and today, and now Ariel is hot and miserable. When ill, the children get to wear sleeping gear all day, not do any schoolwork and either play games (like Monopoly or Life) or watch a movie or two. Yesterday we watched Anne of Green Gables - The Sequel which is a four hour movie. This is a great movie and has inspired Ariel to go back and read the books. We had listened to the first Anne of Green Gables audio book, but now the rest of the series beckons. Yesterday we visited Cade's Cove in Tennessee with friends and their parents, sister and cousins. We started out by meeting some of them locally at about 10:30am and went to meet the husband, his parents, sister and cousins at a water rafting place. We all shared ourselves across three cars and bravely trusting my GPS thingy we started off. Travelling on Route 129 meant crossing the mountain on a section of road called "The Dragon" appropriately named after the many twists and turns matching the scales on a dragon's tail. At the Southern end of the bendy bit is "Tail of the Dragon" with a rest stop. Many motorcyclists enjoy the windy road but as a warning to all travellers there is a large tree with parts of bikes "slain by the dragon". This site has more details. We actually thought the road was quite well made compared to the roads we were used to on Macquarie Pass between Moss Vale and Wollongong, NSW. Our navigating went well until we started going on narrower and more remote roads. The sign "Dead End" was a giveaway that my GPS may not have been completely accurate. 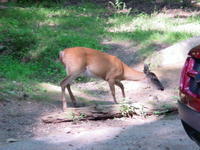 The road DID get to Cades Cove but unfortunately it was only for hikers. So we had arrived about 10 miles from where we wanted to go and had to go about 30 more miles to go the way everyone else does. Cades Cove is a national park based on the the original Cades Cove township and has lots of nature and old buildings from the mid 19th century. The central piece for most people is the 11 mile one way single lane path which travellers can follow seeing the sites. There are places to stop and have a closer look, but there is plenty of wildlife which is completely unfazed by the traffic and interest. There is no hunting here! As you can see by the photo, this deer was content to nibble at the grass whilst a steady stream of cars stopped and passed within a couple of feet. The other cars also were able to spot a bear. Our air conditioning still isn't working correctly and temperatures were around 100F (37-38C) so we were pretty hot. We moved some of the children to the other cars and we had two of their older boys in the back of ours. Maybe the heat started getting to us all but by the end we were singing loudly to the Numa Numa song and Wierd Al Yankovic songs. Also every time the GPS lost satellite reception (due to heavy overhead tree cover) we had a competition for the first to yell "Opa!" - in the same way that was done in "My big fat Greek wedding". We finally arrived home at 12:45am - very tired, sweaty and glad to be home. We were seated at the table after dinner peeling apples to make some Apple sauce and Peter (6) asked for an unpeeled apple. Lana offered him one with the apples we had not yet peeled. "No," he insisted, "an unpeeled one." We then tried to explain that the apple with the peel removed is peeled, and with the peel on is unpeeled. We soon stopped and thought about our explanation. I suppose his logic makes sense. Dad said it's about time I do a post. I read the blog and check for spelling mistakes. That's my job. So there shouldn't be any spelling mistakes. I don't want to blog but Dad showed me another blog and there was stuff posted by the kids and Dad says 'Look they're posting. I just wanted to show you that.' So I am finally posting. Many of our friends and family have asked Lana to show some of her completed cross stitched art. This is Lana's latest creation. It is a 5" x 7" piece on Aida cloth called "Sweet Treat" by Dimensions. I picked it up for Lana from Walmart as a complete kit for well under $10. It is normally an easier kit, but as Lana didn't like the chunkier style she smoothed the edges by using partial stitches taking longer than expected. The end result is as beautiful as ever. It will join the others until we return and get together with Lana's parents and go mad framing the backlog of completed works. Lana's cross stitches adorned our house back in Australia and it was akin to visiting an art gallery. I would give many visitors a tour of the house including all of Lana's detailed works. Lana used to get embarrassed at me showing off her work, but I wore her down! What do I want before Christmas? Just to show that Peter is as good as his bigger brother (see here), he lost two of his teeth today. 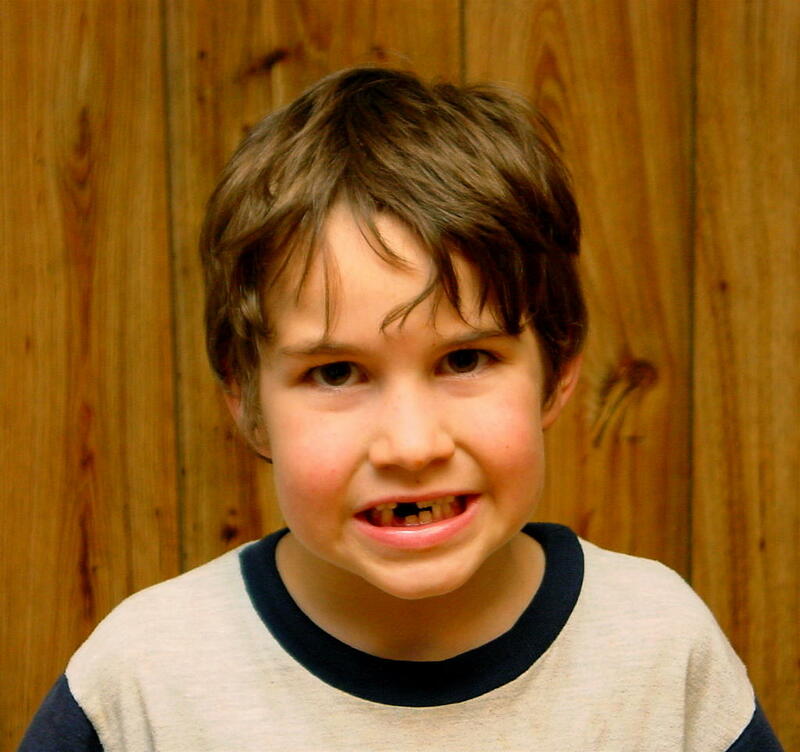 They were his baby teeth but external assistance wasn't really desired to make them move. James and Peter enjoy rather boisterous play at the moment and in the midst of the rough and tumble, James' leg connected with Peter's teeth. One of the teeth was already weakened by Peter's own knee a few days ago. Ah well. At least none of his adult teeth were damaged. The dentistry costs here are incredible. Just for a first visit - with no work done mind you - the charge is $181 ($240 AUD) and then you would have follow up visits for cleaning and whatever. The reception desk quoted me this after I mentioned I had 2 adults and 5 children that needed a dentist, and do they cater for families. After this price, I said that I had no intention of paying over $1,000 just to come back and pay more. $181 x 7 = $1,267 ($1,689 AUD). Our dental insurance would have us travel 2.5 hours away for "cheaper" service. When I went to another dentist who examined my teeth (only $61 for the examination - no cleaning or any work done) I was quoted $1,000 ($1,335 AUD) for a crown or $500 for a filling. I think I'll save some money and wish I was back in Australia where these things are far more reasonably priced. We had a special dessert today - Fried Bananas. 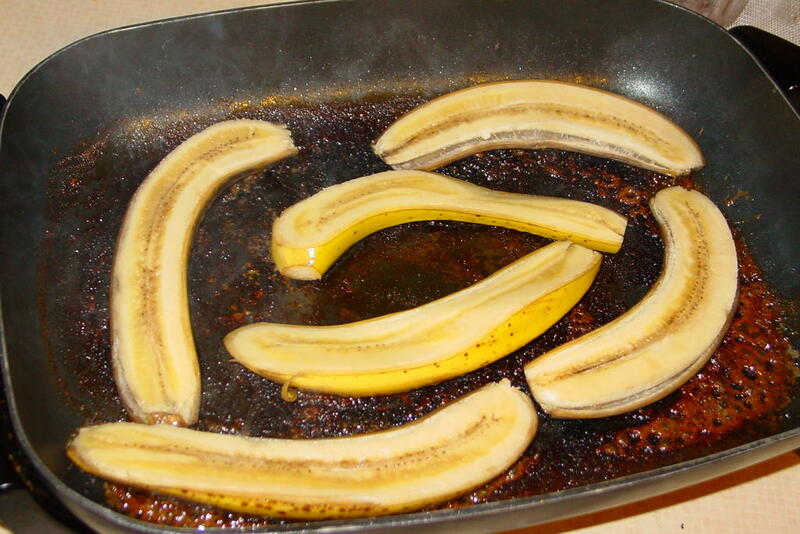 Cut the bananas in half longways (including the skin), and place skin side down on a hot frypan/skillet. The banana cooks inside the skin. Once the skin is all brown, turn over and fry the other side for a few minutes and then take off the heat. Scoop out the banana from the skin and put in a bowl, adding icecream. The juices from the banana become caramelized becoming a very sweet sauce and the inside becomes all soft and gooey. Yum. Perfect with vanilla ice cream or cream. This recipe was shared with us by Lana's parents, who obtained it from friends at a camping event. We have just had our 500th visitor to the site. This is since starting the blog on May 21. 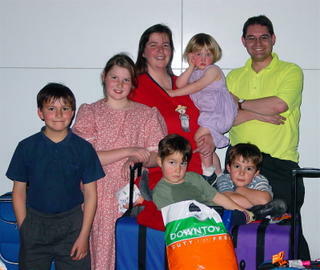 Visitors come from family in Australia, friends and clients in both Australia and the US. The site meter we use to analyse the visitors also tells me that roughly 35% are from Australia and the balance from the US with a few in New Zealand. Sometimes it's amazing how many people one meets. Time certainly flies. Read here about the trip over. 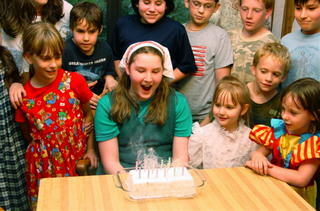 We recently celebrated Ariel's 14th birthday. We had three families visiting which meant there were plenty of children of all ages. Generally the children played inside and outside whilst the adults had an enjoyable afternoon discussed topics range near and far. The highlight was a Treasure Hunt I organised. Ariel had requested I do a treasure hunt for some time so I prepared all the clues on Friday night, finishing somewhere near midnight. There were thirteen clues, each leading to the next, with the last three revealing presents for Ariel. Each clue was in the form of a four line rhyme which revealed (and concealed) the location of the the next bit of paper. The first clue was hidden in what Ariel was led to believe was her present - Idiot's Guide to Grammar and Style . As one would understand, she wasn't impressed. Ariel was a lot happier with the real presents (books and Anne of Green Gables - the Sequel ). The birthday cake is an icecream cake. Ariel made vanilla icecream, then mixed in some caramel sauce and lots of chocolate and caramel pieces. This was placed on the tray and candles were placed and lit. This is a very efficient birthday cake - there is no waste and no-one eats just the icing. After the soap bottle was empty I tried washing it out but it didn't really work so I kept the water in and I shook it up a bit. It worked as water soap so I didn't need to add water. This is how you make it. 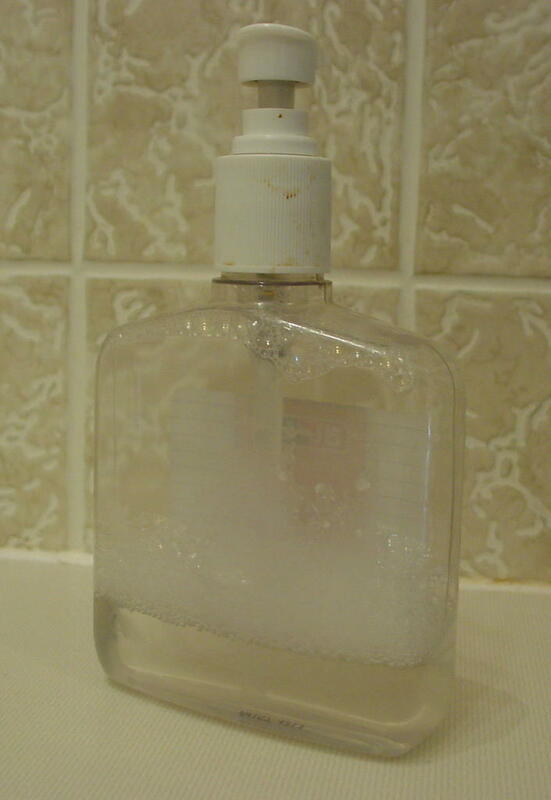 You need an empty soap container that still has some soap in it and you need water and that's about it. Then shake. And voila! Ariel prophesied that it doesn't work. And she's wrong. After Lana had sprayed it white - as this photo shows - the spider was still alive. I asked James (9) what happened. Mum wanted to get it in a bucket because she was too scared to kill it. Then she asked me to take it outside and I asked if I could kill it. Mummy said not yet. When she was inside, I asked, "Now?" and she said "yes" through the closed door. It kept running away but I cornered it and killed it by stepping on it. I took the egg sac upstairs to the table on the balcony and opened it up with some wire. And all these little spiders came out. It gave me the creeps! There was about a thousand. I pulled the sac off the table with the wire and stepped on it. No spiders got away! 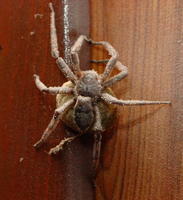 If you want to see the spider in more detail click the photo - if you dare! Update by Lana: I wasn't scared. 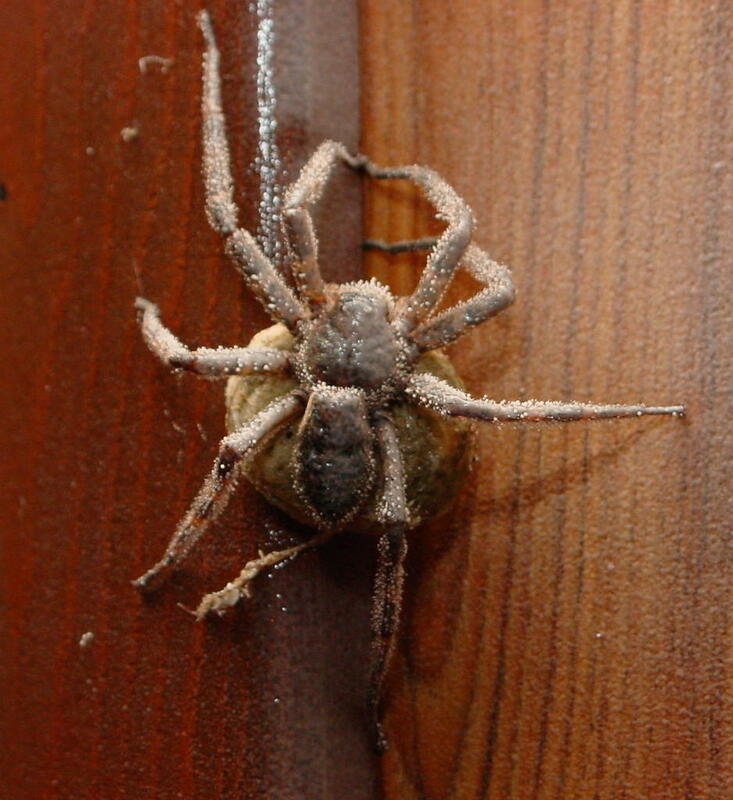 I didn't want squished spider all up the wall with baby spiders scurrying everywhere. I initially thought killing wouldn't be very nice, but with that much bug spray a mercy killing seemed more appropriate. So once it was outside I told James he could do whatever he wanted to do. 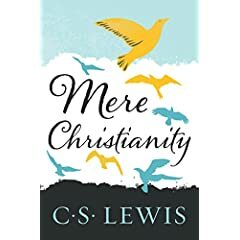 I have just finished listening to "Mere Christianity " by C.S.Lewis. This is an excellent discussion of the basic concepts of Christianity explained in a fascinating simple way. He carefully avoids most of the differences between the various Christian flavours and concentrates on the central hub. In brief, there is a God, he made us as body and soul of which the soul lives forever, we need help to live forever with God, so Jesus came to Earth to pay our debts and help us reconcile with God. It is worth going back to basics on a regular basis. We should ask ourselves questions like, "Why am I here? ", "Why was I made? ", "What am I to do with my life?" and so on. That is why this type of book is so useful. C.S. Lewis has explained in a simple way the Chrsitian answer to thiese questions. Sleep - I remember sleep. 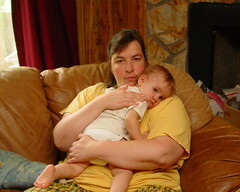 There are times when a baby is unwell. Nothing serious, just a slight temperature, but you know she is unwell. It's all in the eyes - and the restless sleep and desire for contact with mum. Dad and other siblings are only a distant second. Typical - every time I go away something happens. David is away, so I get to handle spiders. The boys were happily playing down stairs with their Lego. Eric ran up and announced, "We have a big problem! There is a very big spider with an egg sac." I wasn't too concerned because they have previously called smallish spiders "big" before. I sort of hurried down stairs armed with bug spray (and the camera). Wow! They were right this time. It was BIG. Holding a very large, very full egg sac. It was approximately 15cm/6in from toe to toe. After taking the required picture for David we sprayed it white. We didn't really want it to fall and hide somewhere, with all those little spiders to hatch - after all, they too will grow that big one day. I wanted to get it outside. I needed a flat-ish container, something it wouldn't get caught in and have trouble getting out again. Some of the small containers the children pointed out wouldn't have held it - and I certainly didn't want my fingers that close to it. Finally, I flicked it into a Lego bucket and James took it outside. The boys inpected it. It was a bit sick from the spray - but it was still moving! James wanted to squish it and rip the sac open to see inside. This he did and he was a little shocked to see hundreds of baby spiders inside. Naturally he then used his boot to commune with nature. Now, every little tickle makes us feel creepy. I was told recently by a reader that they enjoyed our blog because it provided a glimpse of family life she had never experienced as an only child. 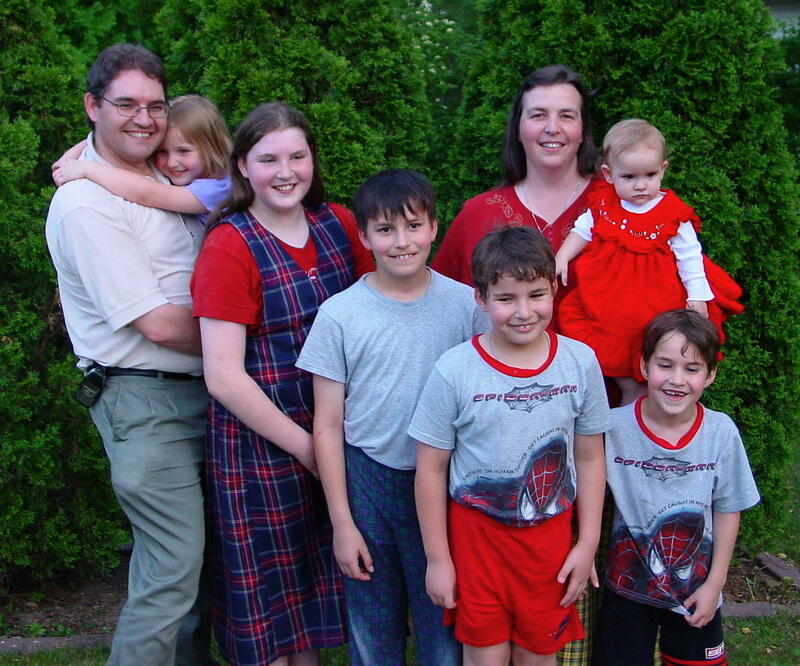 Large families are a funny thing. Often to feel comfortable with them (depending on your personality) you need to grow up in one, or grow up with one. When I met David's family he is one of five. I had lived at home as an only child for three years. My brother left three years before and my sister three years before that. At his place there were people moving around ALL the time. Where ever you were someone was trying to get past you. I took to sitting in the corner where I could see what was happening but was out of the flow of traffic. Now that I have grow up with a large family that doesn't worry me. The easiest thing to do is jump in and go with the flow. And join in what ever is happening. Much like Pascal's wager, act like you know what is happening and after a while you will. You get used to it and before you know it you are part of the family life and find it quiet when the house goes from ten people back to eight when my parents left. When I left home yesterday, we were experiencing the relatively mild edges of Hurricane Dennis. The temperature on leaving was about 70F (21C) and raining intermittently. By the time I was just North of Atlanta I was in the midst of bucketloads of rain and then the skies were clear. As I approached closer to Southern Georgia, I gradually increased the air conditioning and I noticed a temperature sign saying it was 97F (36C). It was in the low 100s by the time I reached the hotel and VERY humid. Quite a change in such a short distance. Lana and the children were pretty happy that it was me, rather than them. I think they are still enjoying being in one spot. I am helping a client in Southern Georgia at the moment who are about a six hour drive from home. To make the trip easier I always listen to a book (or two) on our iPod. I have just finished 1776 by David McCullough covering the crucial time of the War of Independence. It is read by the author and is a riveting account of how the whole American Revolution was close to abject and absolute failure in late 1776. The audio book lasts for almost 12 hours, which should have been enough for the return trip, but it was so compelling and fascinating that I listened to it back in my hotel room! Did you know that after forcing the British to retreat from Boston in early 1776, Washington almost lost everything in New York in Mid 1776? From a force of almost 20,000 men at July 4, 1776, he ended up on the very cold banks of the Delaware in December 1776 with only 3,500 wet, miserable, underfed and underwhelmed troops. I found it especially interesting picturing New York, Long Island and the retreat to Pennsylvania as we had driven over that very area in our recent trip. Many of the names were familiar - although the population is much higher than it was then! Be warned - some of the narrations are not for younger ones, detailing some of the terrible things armies do to civilian populations - especially the women and defenceless. As a read aloud, dutifully skipping those bits which only total a few pages - at most - out of the 750 page book, 1776 makes an excellent history lesson. The greatest risk the Continental Army faced wasn't the British and German troops, but lack of resolve of the Congress and the people. Even then, as exhibited in the volumous letters written by all ranks in the army, everyone knew the reason they were fighting - for Independence and freedom. 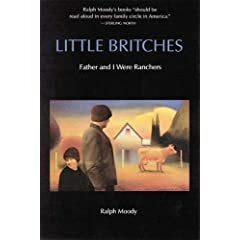 I have just finished reading Little Britches by Ralph Moody. It is a story of Ralph's childhood growing up near Denver in the early 1900's. The children eagerly listened each night as we heard how Ralph and his family moved from Eastern US to Colorado, how they survived their poorly serviced farm, how their Father was very resourceful and how Ralph either overcome various temptations, or succumbed and paid the price. Most chapters ended in discussions of what the children would do in similar situations, or what they should do! This is the first book in the series by Ralph Moody and we have now started Man of the Family which begins immediately after Little Britches finished. I highly recommend this as a book for all the family. Chiggers are microscopic larvae of a type of mite that lurk in unkempt areas of park or garden. They are related to ticks and are about 1/150th of an inch in size. They basically jump on when you walk nearby and then crawl up until they can't go further and then dig in. Only problem is they can't handle human blood and skin so they die and drop off, leaving their drinking tube in the skin and causing itching worse than mosquito bites. A popular method for getting rid of chiggers is to put nail polish on the bites. The only problem with this is that the chiggers are already gone. 1. Make sure all lawn areas are mowed and garden areas constantly maintained. Then it is too busy for chiggers to stay. 2. Put your pants in your socks so they can't get on. 3. Once home after a walk in the woods or unkempt areas throw all your clothes into the wash and have a shower. 4. Buy a supply of anti itching cream when this all fails. This is a good site for more information on Chiggers. That's where the lovely photo has been obtained - it is of a friendly chigger enlarged about 1500 times. The larval form is barely visible to the human eye. This information has been shared because some chiggers got me at Cooper's Creek. Bother! Since we watched the first ''MacGyver '', James wanted a Swiss Army knife so he could be like MacGyver. Dad looked on the Internet for a Swiss Army knife and found one for about $10. James bought it with his pocket money and he was so excited he was going to get a Swiss Army knife and he could be MacGyver. A few days after he got his knife he looked around the house for stuff that MacGyver would have with him. Here is James experimenting on a big blackberry bush. He is looking in his special backpack for something he can use to do something to the blackberry bush. His knife is attached to a key ring on his belt. This might look easy ..
Now that Rose is Australian (as well as American), she needs an Australian passport. The hardest part of this is just getting a passport photo. So Lana and I visited to our local CVS pharmacy who can assist in this kind of thing. We could have done it ourselves, but figured it would be easier to get done with the right tools and sizes and lighting. The extremely busy lady behind the photo counter came out with her low cost digital camera in hand and looked at us inquiringly. We lifted Rose and said "Rose needs a passport." "Oh." she replied with a worried expression, "I haven't done one this small before." So the comedy began. First we tried Lana holding her up with me making funny gestures behind the girl's head. Then we tried Rose on my shoulders with Lana gesticuating wildly behind the girls' head and sides. The key was to have Rose close enough to the pull down screen to avoid a shadow without her being distracted by it and have her look at the camera. It was a game of hide and seek, trying to get the camera to click when Rose wasn't looking elsewhere. Finally, with a smiling crowd of onlookers grateful for some free entertainment, we snapped this shot. Phew! A communal photo if ever there was one. Update: Aargh! US passport photos are 2" square. Australian ones are 1.5" x 2". So we had to scan and crop the photo anyway! Update 2: Nope. That won't work. The Passport photo requirements are pretty strict and we are going to have to do this again! He tries this even though he writes better than us, writes about things that we suggest and is more often using the computer. Guilt. "Other than me, Eric is the only other person to contribute. Don't you feel bad?" Well, No, not really. Productivity. "You should learn to use the computer for something useful." Yes we should but we still haven't done it. Role model. "Lana you should post something. It's a good example for the kids." I am being an example on how to avoid this. He foolishly believes that we have something to add from a different point of view to him. He doesn't realise that we think differently. David looks at the everyday kind of things with a upbeat attitude and makes it interesting. To sum up this is the first post from me (that example thing) and there may be more one day. Who knows? While we were on our recent trip we visited a family that had the Lego Star Wars Game . They had purchased it a while ago, and at first it wouldn't work properly. Then I thought about going to "Start" instead and to me and William's (the boy I was playing with) surprise it worked! Of course we then played it and it was really, really fun and sometimes hard. A few days later Dad bought the game, but we had to wait until we got home. Then we played it for a while until Dad told us to stop and go to bed. We can only play it on some weekends if we have finished our school work, but we get some good ideas on building Lego creations. The game doesn't work on all computers as it requires some advanced graphic features. This meant Dad had to do a bit of experimenting to get it to work. He says to download the demo before paying for the game. Update: There is going to be a Lego Star Wars game for the Mac, it will be the same as the one for Window's but it work's on the Mac. Lana's treat for the happy campers today was Chocolate Truffles. We made a double batch so there would be plenty to go around and there were none left after a short while. Whizz the biscuits/cookies until they are small crumbs. Throw all the ingredients together and mix up until it is a gooey mess. Wash your hands and roll the mixture into small balls, rolling into the coconut until they look like the photo. Then refrigerate. Update: Americans shouldn't "whizz" anything. Use the food processor to chop it into little bits. I have heard from one of our US readers that "whizz" means something else entirely! She had a similar reaction to us when we heard people "piddled" around at home. We celebrated Independence Day with our friends at Cooper's Creek. As usual the children played in the water and generally mucked around and the adults chatted. At 3 pm or so, our friend David announced that they knew a GREAT fishing spot only a short distance away and asked if I would go. I didn't have any shoes appropriate for wading so I passed. David, his father and their friend were dropped off by car near the spot so they would only have to walk back. Almost two hours later, David came into camp tired and wet dragging something on his fish line. Between exhausted expressions that it was further away than they thought we asked what was in his hand. It was the fish David is "proudly" showing in this photo. He would have thrown it back but it was killed by the hook so they had to take it. 'Twas a lot of work for little gain. On Friday evening, we decided not to visit as heavy rains had started. We later discovered that the "happy" campers had sat up until 2am, watching the rising creek and wondering if they would have to evacuate. Luckily it abated. As the campgrounds are used often and by many people, there are all sorts of bits and pieces left behind by and for other campers. This includes ropes for swinging across the creek, and handy logs for climbing across the creek. Clare felt pretty brave and decided to try one of the ropes. Standing on a rock she grabbed the end of the rope and jumped in. When we were here last year with Lana's Dad and Mum, her Dad had great fun assisting the children in re-aligning the rocks to form better rapids in front of the campsite for better rafting. Many of his improvements are still there. Local friends of ours and their parents regularly camp out at a local nature reserve known as Coopers Creek. It is a beautiful place where we can just relax whilst the children play in and out of the water, and all can sit around by the fire (but hopefully out of the smoke) and others can fish. Eric went with his friend, Jonathan, and caught two fish. This photo is of the lovely lunch we had yesterday. The corn is just placed on the wire grill above the fire until the green bits go brown (or burn and the fire is quickly blown out!). Then the brave men all peel the corn and - very quickly - grab the HOT yellow corn cob, break it in two and place it in the waiting bowl. Just add butter which quickly melts. The cast iron pot contains Sloppy Joes. This is like a bolognaise sauce - a tomato paste and ground meat (beef or turkey). It is spooned onto bread rolls. In Australia, a Sloppy Joe is a name for a sweater/jumper/pullover. Considering the nature of the food, Sloppy Joes can be worn in both countries! The children are really enjoying the Summer reading program at the local library. Other than the reading of a book or two, they have some authors visit and discuss how books get published, where their ideas come from and read and discuss their stories. There are crafty activities to do and either before or afterwards the children get to look for some more books to take home. Everyone gets to take part, even Rose is sitting down waiting for a book to be brought to her. Two days ago we mentioned the plight of much of Australia with drought. I have just heard news that Lismore in Northern NSW is flooded and Sydney had bucketloads of rain, too. This is typical of Australia - always too much or too little. So, keep up the prayers and ask for a good soaking rain for the areas that need it.